With great anticipation, and a little nervious anxiety looking at the calendar, the 2017-2018 winter season of skiing and riding at Killington began this morning. Season pass and express card holders were invited by the mountain to begin the season today at 9:30 AM. And hundreds showed up to enjoy the first turns of the season. 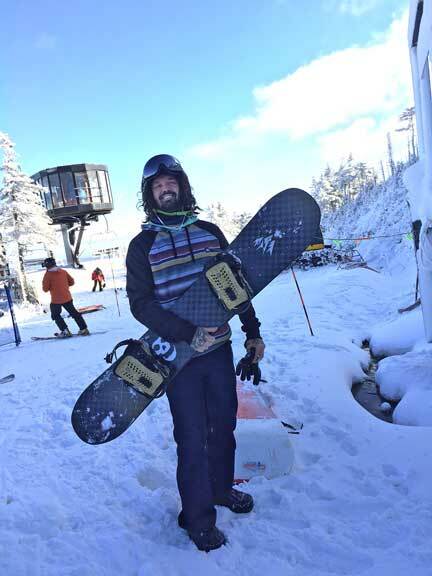 Tomorrow the resort will open for the general public at 9:00 AM with service to Killington Peak via the K1 Gondola. Skiing and snowboarding terrain is on the Rime and Reason trails, including an early season terrain park on Reason. The open trails are serviced by the North Ridge Triple chair, which will load until 3:45 p.m. Last run down Rime and Reason is at 3:30 p.m before guests will be asked to walk out of the area on the "Stairway to Heaven" to Killington Peak to download on the gondola. Unfortunately, as luck would have it, inn business kept Mary and I away from the mountain today (more on that later)... But several of our employees were able to partake. From thier reports back, they were really stoked by the conditions, which included beautiful soft snow, moderate temperatures, and a brilliant blue sky. Chef Colin out for some early season turns on his board today..
20 years ago, to the day, the first large pieces of machinery arrived at the property Mary and I bought. The transformation of 37 Butler Road from a private residence to the Birch Ridge Inn was beginning. In a fit of irony, 20 years later, heavy construction machinery is onsite again as we prepare the inn to greet guests for the winter. While todays project does not involve digging a new foundation for a building, it is equally important. 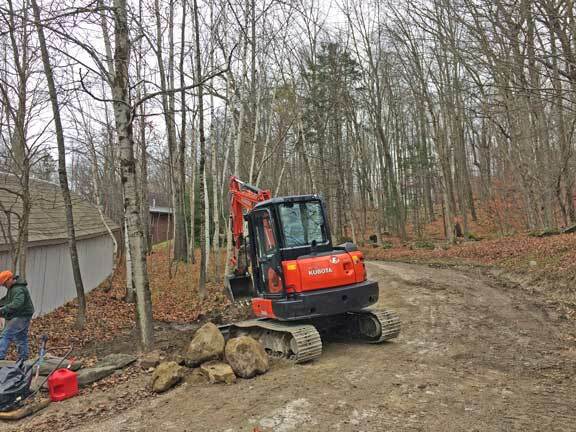 Each year before the onset of winter, we grade out the driveway to make sure that it can be snow plowed effectively. This year, in addition to doing the re-grading, we asked the contractor to re-work some of the drainage on the driveway to better handle water flow. While we have always gotten a lot of precipitation in Killington, over the last 5 or so years the nature has changed dramatically. What used to be slow and steady showers has turned into an all or nothing proposition. Now when it r@!ns, it usually comes in a torrent. The torrents, over time, eroded the ditches on the side of the driveway that were rebuilt in 2011 after Hurricaine Irene. In addition to digging out the trench on the right side of the driveway (going up to the inn), we also had our contractor add a new drain pipe under the driveway from the carriage way. Working on rebuilding the driveway to the inn. At the same time the driveway work was taking place, one of our neighbors had his contractor digging in a sewer line right in front of the driveway and carriageway. We had the inn on a planned shut down so we could continue our efforts to transition from the fall to winter seasons, so business was not impacted. But, needless to say, access to the inn has been a little tricky the last couple of days. All is not lost, however. Our neighbor had the local asphault contractor re-pave in front of the driveway and carriageway this morning. Before the paving took place, our contractor had multiple yards of material deposited on the driveway to build it up for re-grading. That began this afternoon. Access to the inn should be back to normal tomorrow (Thursday November 9th), with the exception that the scars of heavy equipment will be still visible until the first snow fall of the season erases them from view. Just because we were land locked at the inn does not mean we were sitting idly bye. The annual "Leaf Rodeo" at the inn was underway in earnst today. Pick your favorite weapon....rake, tarp, wheel barrow, leaf blower. They were all in operation today. The Green Mountains are really beautiful in the summer and the fall... but the piper needs to be paid when the leaves decide to head for the ground. Fortunately, today was crisp and sunny. 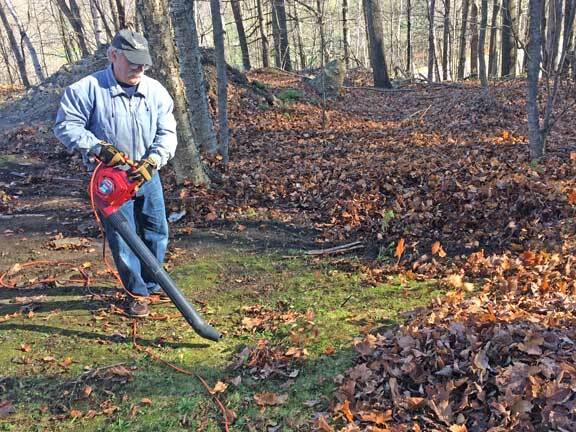 The perfect day for picking up leaves. "Leaf Rodeo 2017 " underway with the assist of a leaf blower today at the inn. We will be working around the inn for the next couple of days as we prepare to re-open for the winter season on Friday. If you are inn Killington this weekend, stop in and say hello. Wherever you may be, however, "Think Snow" at least for those of us up here in Killington.